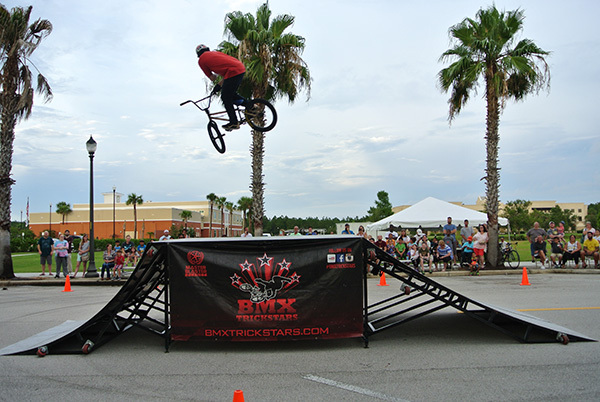 Palm Coast - See the BMX Trickstars perform at this month's Food Truck Tuesday - a mix of food, fun and entertainment set for July 18. This is Parks and Recreation Month so come "Get Your Play On" at Central Park in Town Center. Food Truck Tuesday will be 5-8 p.m. along Park Street next to Central Park in Town Center. The address of Central Park is 975 Central Ave., Palm Coast. The featured entertainment, the BMX Trickstars, are a well-known traveling stunt show that performs a variety of BMX bike stunts and freestyle tricks. The Trickstars will be performing twice, at 5:30 and 7 p.m., and they will be available for photos and autographs in between. Each Food Truck Tuesday, presented by the City of Palm Coast, features free entertainment and a variety of food trucks - mobile kitchens, canteens and catering trucks that offer up gourmet foods including appetizers, main dishes, side dishes and desserts. There's even a tent offering wine and beer, including craft beers. The food trucks signed up for July include: Monsta Lobsta, Barnwood BBQ, The Good Food Truck, Woodson's Wrap Shack, Marco's Seafood, Arrested Appetite, Surf N Soul, Tiki T's Mini Donuts, Boston's Fish House, Bruster's Ice Cream/Nathan's, London Fish & Chippy, My Cousin Vinny, Kona Ice of Flagler County, It's All Greek to Me and Big Island Bowls. Food Truck Tuesdays is held every month, on the third Tuesday of the month, through November. Proceeds this month will benefit the Parks & Recreation Scholarship Fund. Food Truck Tuesdays is presented by the City of Palm Coast Parks & Recreation Department. For more information, call 386-986-2323 or visit www.palmcoastgov.com/foodtruck.